a paranoic`s paradise. 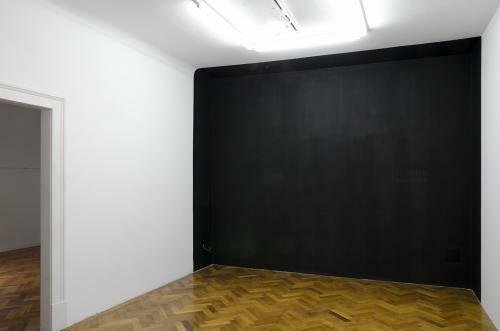 two rooms, where you can experience some kind of isolation from the outer world. in the first one there is a zone without an electromagnetic smog, a place that we can hardly experience anywhere else these days. no wifi, no mobile phones, no data transmission on radio frequencies. the latter one is a space where no one can intercept your conversations – they will disappear in white noise, which is absorbed directly by walls and windows of the room. 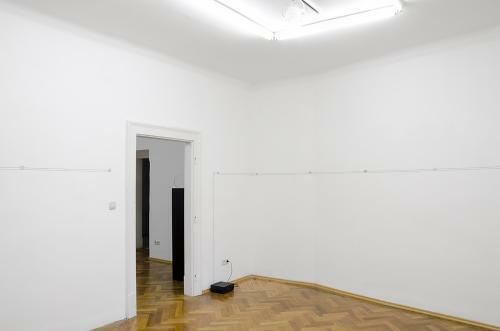 ján gašparovič creates minimalistic environments with sonic and electromagnetic qualities instead of physical objects; two spaces where there is no communication with the surroundings, at least not such as we are used to. stability, or also lower reactivity. you better call your parents before you enter the gallery. gašparovič`s environments are accompanied by two works by jaroslav kyša. 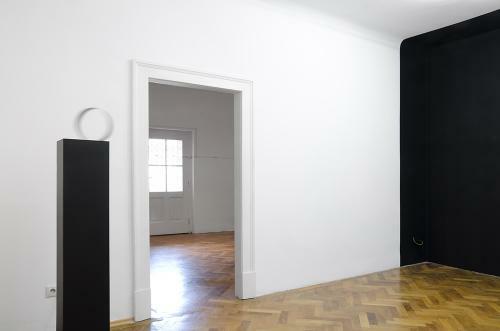 if we perceive an isolation from the outer world as a certain kind of stability, kyša`s object in the first room, is literally the complete opposite. 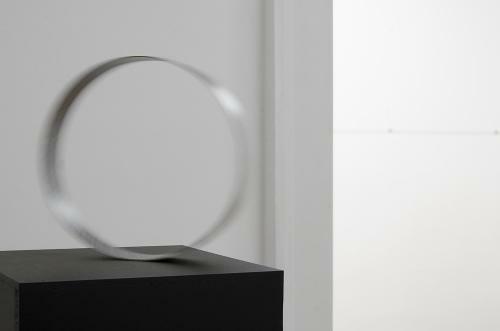 work entitled almost fallen plays on the viewer`s knowledge of primary school physics. 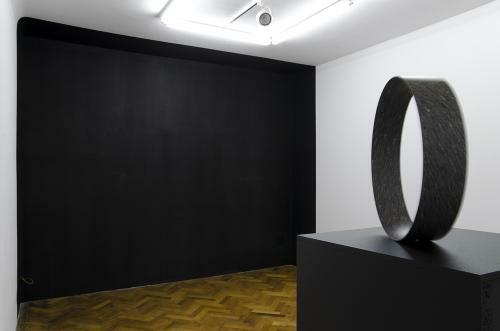 technology of kyša`s object is, unlike in gašparovič`s installations, concealed. the viewer constantly expects its fall. a neurotic history is revealed in his intervention in the other room. footprints on the floor remind us of monotonous movement of an unhappy felid captured in a cage in the zoo. on one hand sonic qualities create seemingly stable environment in the room, on the other hand they simultaneously escalate anxiety of the individual. a conversation cannot be intercepted, but maybe in reality it does not even exist. it is only a psychotic monologue of a lonely person locked in a room that has to be hidden. the title of the show of ján gašparovič and jaroslav kyša has been borrowed from mendeleev periodic table. isotopes of superheavy radioactive elements from the island of stability are by theory predicted to have the greater longevity than their neighbours from “the see of instability”. the island of stability in the periodical table has become a metaphor for subjective exploration of a dyad stability – instability in art practices of the two artists. what is stability and instability in personal, social and political life and what is their relationship to strict scientific perception. 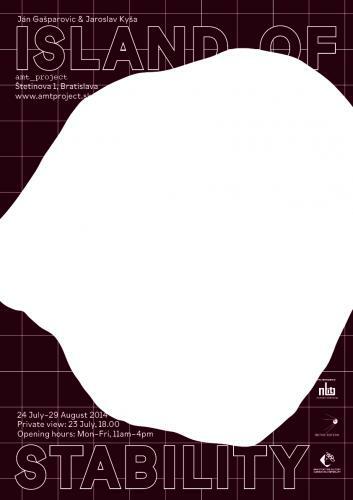 the exhibition is realized with the financial support of the ministry of culture of the slovak republic and nbit.